I love homemade playdough and try to make sure we always have some on hand. One of the great things about playdough is that it is so simple to change the experience by changing the accessories. Playdough Sensory and Color and Animal Print Playdough are two great examples. Winter is a great time to have a little extra fun with playdough and playdough accessories. Anyone want to build a snowman? Getting creative with playdough accessories is fun! For this project, I wanted to include everything the kids would need to build snowmen as well as some extra Christmas goodies. 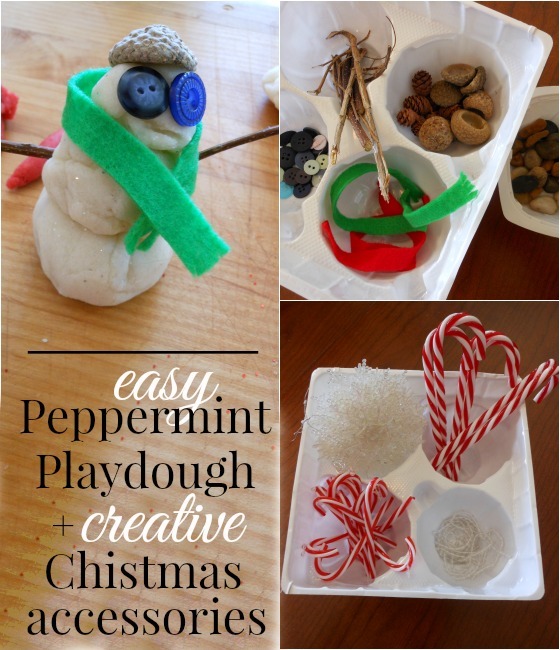 Do you have any Christmas playdough accessory ideas to add? 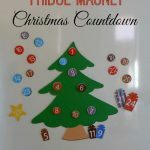 This post originally appeared December 11, 2011 as a part of Creative Christmas Countdown. A lovely advent activity – and top marks for sticking with the theme and drinking *peppermint* tea! Thank you Cathy. Hee hee… It’s my new favorite drink! I love it. This is a good family activity. Thanks for sharing. Thanks for commenting. I agree, it would make a really fun family activity. Loved YOUR activity!! Recognized a few of the snowman decorations too! Great job on your blog. This looks like a ton of fun. I’ve got to get to the store to get some peppermint extract and some of those cute candy canes. My son will love this! Thanks for sharing, Jill! This is SO adorable! I’m a huge fan of play dough and we make new batches of it every other week, just to add to the range and variety! 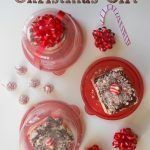 I love the idea of making snowmen and candy canes- just perfect! Thank you Anna! We had a blast. I love this post! I ran a similar post the other day and didn’t even realize it- although, I’ve never cooked my own play dough before! Beautiful pics! Try the cooked play dough… the texture is awesome. Thank you for the comment! My daughters would love playdough with peppermint extract… particularly if they get to eat candy canes at the same time. Thanks for the idea. We did this activity today and liked it even better than the gingerbread man hunt (also a hit). My three-year-old and his 2-1/2-yo friend had a blast, especially with the bowls of twigs and buttons and with cookie cutters. The cooked play dough recipe was easy to follow and felt great to work with. I don’t think I’ll go back to store-bought … too many extracts to try. (Though next time I need to remember to check against evaporation before starting the recipe. Turns out my full bottle of peppermint extract had, over time, dwindled to a half-teaspoon.) Glitter in play dough was a new idea for us, too. I’m not sure the kids noticed it much, but I loved it.